So you may be wondering why I am bringing up a prayer on our therapy website when Brevard Family Wellness Center is not a religious institution. 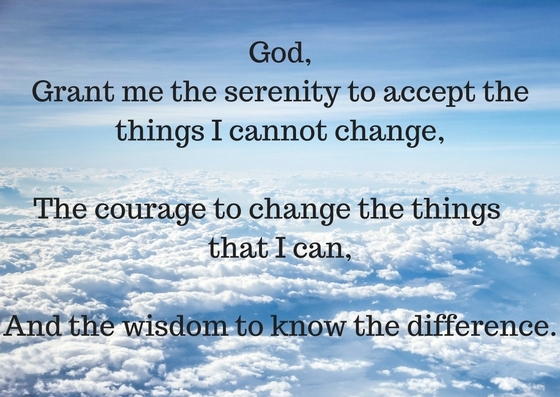 The reason for this is because there is such great meaning behind this for therapy and I don’t want to reinvent the wheel when so many people are already familiar with the concept from the serenity prayer. So again, how does this exactly apply? There are so many different theories/modalities of counseling and treatment out there. ONE of the main things a therapist is likely to look at in counseling is a person’s thoughts or cognitions. See, our thoughts influence our feelings which influence our actions. For instance, if I were to engage in a negative thought about myself such as “I am a failure”, I am not likely to be in a very happy mood (and likely give up or not try very hard). If my thoughts revolve around my successes and how I am learning from each mistake, however, I am likely to feel better about myself (and give it my all and therefore am more likely to succeed). Makes sense so far right? So what many therapists decide is that we have to change our thoughts. If you keep thinking that you are failure then why not stop? Why not think something different? This is something I work on in session with clients often and you can even read more about some techniques to change your thoughts here. In reality, this sometimes works. We are sometimes able to change our thoughts or focus on a new perspective and find that our symptoms lower or even go away completely in the moment. For other people (or it may also be dependent on the situation) this only adds fuel to the fire. The more they try to change their thought, the more energy they give it. They fight it and argue with themselves and only get sucked in further. So what are you supposed to do in this situation, when you cannot change the thought? You can have the wisdom to know that trying to change it isn’t working and try to accept the fact that you are having a negative thought. You see, we all have negative thoughts sometimes. It is part of the human experience. Think of anyone that you look up to, someone obviously very talented, creative, or brilliant. Chances are even that person has thought they were a fraud multiple times in their life. You may be thinking, “so you just want me to accept that I think I’m a failure,” or whatever your negative thought of choice is. And to start with yes. This is the first step in taking away the power of the negative thought. But I’m not going to leave you there (well I am for now). In a future post I’ll talk about what to do next! If you have gone down that road before of trying to change your thoughts that lead to feelings of anxiety or depression with no success, just know, there are other options. Call us now and we can help you create your personal path to peace and recovery! ← Can Coloring Reduce Anxiety?